1. Jia-Wei is focused on IPO counseling and doesn’t audit public firms. 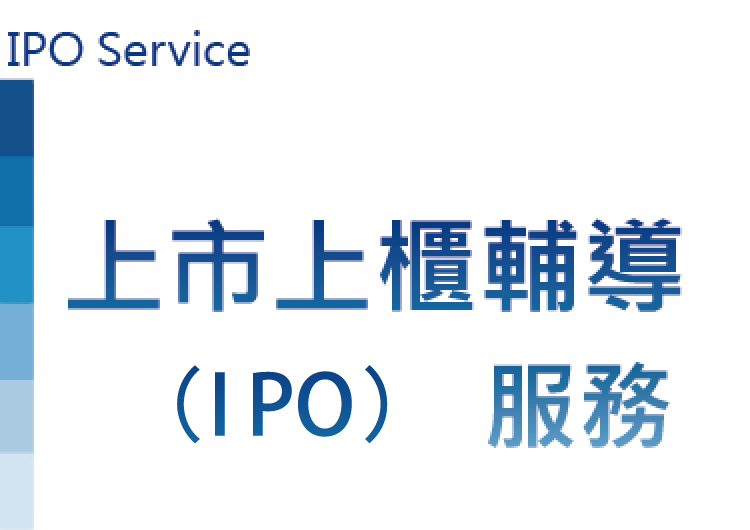 Therefore, there is no conflict of interest and Jia-Wei can lead the financial accounting department of your company to complete the IPO transition. 2. There are 20 counselors in Department of IPO Service; most of them had worked for Big Four, and nearly 10 of them are CPAs, resulting in high quality services. 4. Customers: International Games System Co., Ltd. / Career Technology (Mfg.) Co., Ltd. / TaiDoc Technology Co., Ltd. / Addcn Technology Co., Ltd. / Alltop Technology Co., Ltd. / Jhen Vei Electronic Co., Ltd. / Hold Jinn Electronic Co., Ltd. / Casing Macron Technology Co., Ltd. / Li Shin International Enterprise Corp. / Chief Land Electronic Co., Ltd. / Health And Life Co., Ltd. / Dexin Corp. / La New International Corp. / I Yuan Precision Industrial Co., Ltd. / Keding Enterprises Co., Ltd. / iROO Co., Ltd.